Please enjoy the article that appeared recently in the Westlake Picayune and The Statesman. Westlake resident Judith Dullnig always thinks about the bond between mothers and their children, not just as Mother’s Day approaches. But, she’s taken it a step farther: She created a program that strengthens the bond between those who society has forgotten – female prisoners and their children. In 2003, the educational psychologist founded the Women’s Storybook Project, so that children of incarcerated mothers could be reassured by hearing their absent mothers read to them and mothers could improve their self-esteem by practicing positive parenting. Just thinking of a child being separated from his mother motivated Dullnig. She had experienced that in a different way, after losing both her parents by the time she was 8 and being raised by her mother’s sister and husband. Her first prison visit started with four tape recorders, five volunteers and 25 books. Today, 200 volunteers visit nine Texas prisons. More than 15,000 books have been sent. 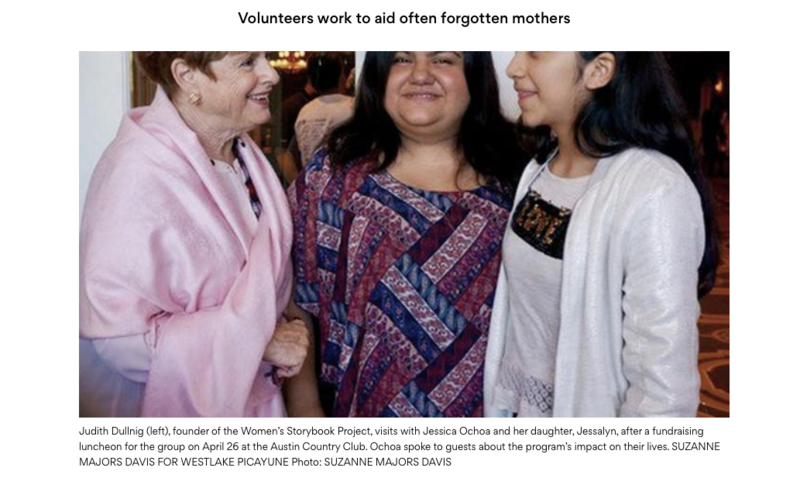 Last year, Women’s Storybook Project volunteers provided over 4,000 hours of service. Dullnig said the female prison population is rising, and one reason is bad-check writing, which is a felony. Her volunteers don’t meet with maximum-security offenders. After being screened and trained, volunteers work with mothers to choose a book, record messages for their children, and record them reading a book. Then, their gifts are sent. Prison visits are made one Saturday per month, and inmates can participate four months in a row before new ones are chosen. Her young daughter said of the gift, “When we heard her, we had tears of joy. It felt like she never left.” Many children replay their mother’s recordings over and over. Longtime Westlake resident and Eanes school board member Ellen Balthazar, an adviser to the charity, happily told guests that WSP met major goals by hiring a paid staffer, and updating recording capabilities. With a Google app, families can now download recordings from the Cloud and listen from multiple devices. “Our program is really respected by TDCJ wardens,” Dullnig said, noting she wants it to be available in all female Texas prisons. She said the nonprofit organization will send special electronic gift notices to those who make Mother’s Day donations through the WSP website, www.storybookproject.org.